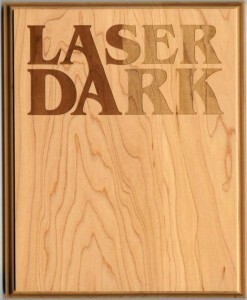 Laser Dark™ is an easy-to-use, semi-transparent coloring spray for enhancing the laser-engraved area on most types of wood. Pre-Laser: The Surface must be covered with masking film prior to laser engraving. TransferRite Paper Masking Film is recommended. Laser Dark™ Application: Shake can for at least one minute, listening for mixing ball. During application, shake can intermittently for approximately ten seconds at one to two minute intervals. Press valve all the way down. Do not extend finger beyond the valve. Hold container about four to six inches from surface to be sprayed. Move back and forth, releasing valve after each stroke. Apply one medium coat. For best results, spray at room temperature (68º-78ºF, 20º-26ºC). Allow 1 to 3 minutes to dry. Finish Coat Application: Use the same procedure as described above in the Laser Dark™ Application. Use a light to medium coat of Finish Coat. Allow 5 to 15 minutes to dry. Clean Up: Clean spray valve immediately after use by turning can upside down and spraying until clear gas comes out. If valve becomes clogged, pull off and clean with paint thinner. Do not stick pins or wire into can opening. Replace valve firmly with valve opening pointing away from you. Drying times will vary depending on room humidity and other environmental conditions.